We offer a complete suite of simple-yet-powerful solutions, scaled and customized for small and large companies. GetResponse Email Software or something more? The Ease of use for this platform is staggering for beginners and for proficient users alike. There are even training guides and videos to help you get up and running quickly. The platform has so many automations that you can set up to automate your onboarding process and you won't believe how easy it is to set these up. There is a very powerful Workflow Editor that makes setting up a complete email marketing campaign a breeze and the templates are reasonably laid out, so you can build your whole campaign efficiently and quickly using templates or if you need a more complex setup you can build from scratch. 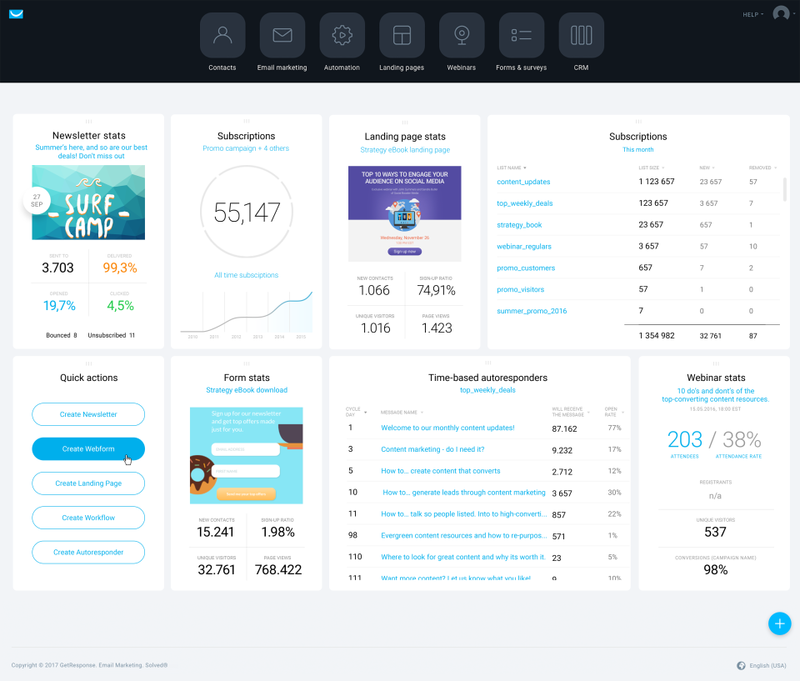 Finally, the reports and statistics tools are very robust and can help you to understand what is working the best for your business and what campaigns need some rethinking. Additionally, the pro plan offers access to webinar marketing. All plans come with a free 30-day trial so you can get started with no upfront investment. The smallest plan only allows for a 1000 subscriber list and access to the landing pages. If you grow fast you will need to bump up to the next level which cost more however you also then get access to 5000 subscribers and you get access to do the webinar marketing so it's not really a negative. You also get access to several other useful features. Overall: When I started my business, I needed a way to digitally manage and track my engagement with potential customers and converted leads. I also needed a way to keep my content subscribers engaged and up to date with new content I was releasing. I decided to take a look at GetResponse and I am very glad I did. What I found was not just a simple email autoresponder, but a complete digital marketing platform. Sure, I am able to set up automated email lists and responders but it's much more than that. I can manage my newsletters, and it's an easy process because they even give you newsletter templates which are very convenient and easy to use, but you can create your own if needed. One of the best features about GetResponse is the Workflow Editor, it allows me to set up specific processes, so I can create a landing page then perform an email collection task and push them to the content they were looking for in a fluid simple movement. Once the email is collected it can go into a holding pattern and the software will automatically send the contact a welcome email right away or at a specified time after the initial engagement. You can even set up emails in advance and time them to be delivered days after the initial contact to remind them of your brand and keep your business on their mind. 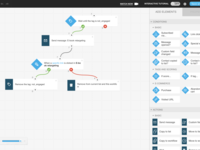 The visual elements of the Workflow Editor make it so easy to set up very complex marketing and content delivery campaigns with very little effort. One of the most powerful email tools you can get. Pros: I like having an email service where I can house all my contacts. GetResponse allows me to maintain multiple lists. There are tons of templates where I can compose any kind of email I can imagine. All the emails I've ever sent are maintained as templates that I can re-use or study for their analytics. I can go into sent emails and see who opened which emails and who didn't open them. I pay for the service based on the number of active email addresses I have in the database. And, if anything ever happens to my site or my social media outlets, I always have my list to take with me wherever I go. Cons: I'm not a fan of how they handle their billing. It seems the bill date moves every month. It makes me think I'm paying for 13 months in a calendar year instead of 12. I also don't like how they do their count to determine billing. For example, an email address on 3 separate lists counts as 3 separate contacts. So, you may not have hit their limit for billing with the overall number of addresses you have on file. But, segmenting your lists and having the same email address on multiple lists may put you over your count and move you into a higher billing tier. That may not bother you but for me, I am often scrubbing my lists for inactive email addresses to make sure I'm not paying for someone who never opens my email.s. Overall: One of the best parts of GetResponse is the customer service. I am one who likes to get on the phone to discuss a problem. But they have it set up where you're routed to a live chat. I was resistant to use this format but everyone I've ever worked with when I've had a problem has been courteous and very, very knowledgeable. Without exception, we've been able to go back and forth on chat and resolve my issue. So, while I do not like live chat, it has worked like a charm for my GetResponse account. Pros: I love the ease of use and ability to create a very large backlog of emails quickly. I like to send out daily newsletters to my list and after about a week or so I will go back through and add those emails into an autoresponder that I will use for new leads that haven't been getting the original newsletters. This makes my life so much easier and allows me to spend less time on the platform while getting more done. In addition, I love the Spam Score feature that helps keep my messages out of the spam folder. If your email is going to spam, your message isn't being heard. Cons: I would like a little more landing page functionality. I find templates either have too much preloaded or not enough. I would like there to be more functionality similar to that of ClickFunnels or even Builderall. If there was further functionality to create sales funnels and take payments through GetResponse I think that will help as well. People like myself want to have everything all in one place for their business. 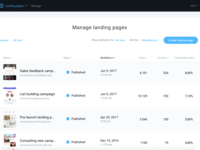 If they can get all they need (landing pages, sales funnels, email marketing, automations) in one place it would make life much easier and GetResponse, in this case, a much more desirable platform. Overall: I use GetResponse to generate leads through the landing pages feature while sending email newsletters to my lists daily. In addition, I use the autoresponder feature to have content and sales emails sent for me so I can spend more time building my business and traffic sources. Pros: Get Response gave me a very smooth and cohesive introduction to all the elements of email Marketing and Campaign Management. It simplified so many buzz words I have heard for years and is still doing amazing things for my clients too who are new to email marketing and campaign management. Extremely useful for Branding your eMail Campaigns. Cons: More tooltip text or hints , like a small hover box with information. The Webinar did not always work well. 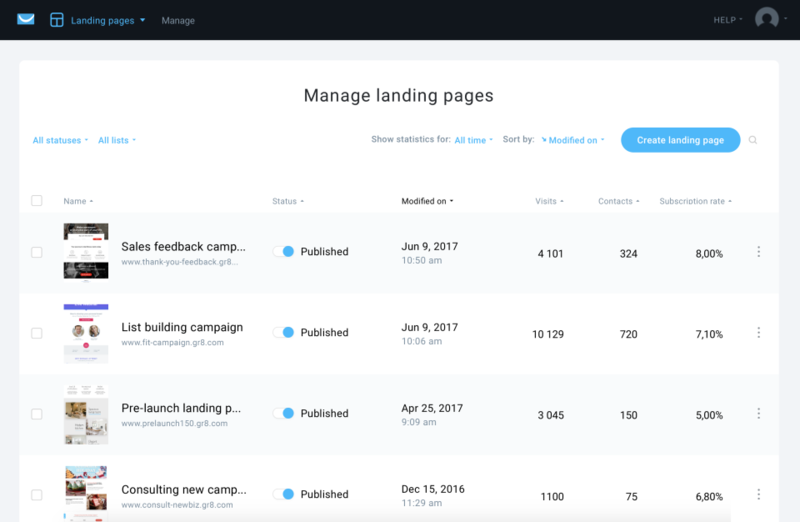 Overall: Get Response is used mainly for landing pages and workflows (aka Funnels). Very very handy and eMail AutoResponders have been implemented easily. You can save templates that you use over and over again and just adjust minor things for different applications or products/services. Always learning more and more as they release following the BETA Test, more amazing features. There is also a Webinar option that I have used. Taught many of my Clients eMail Marketing by using Get Response. It made so much sense to them as many who create eLearning for sale do not realise that they need an automated system of some kind for tracking and selling via auto responders for residual income ROI. - Autoresponders - this is a must-have marketing tool these days. GetResponse's highly-rated autoresponder features were one reason I switched over from another similarly priced tool. - Easy-to-use designers - This was also one of the features that made me switch over to GetResponse. I simply love the drag-and-drop designing interfaces for forms, emails and landing pages! They make my website look professional. - Landing pages - This would have cost some extra money if it were not included. While not the most innovative solution out there, it's a nice-to-have alongside the core features. Cons: I've been building my mailing list with the old interface and while a little ugly, was pretty intuitive to use. The new interface is a bit hard to get used to. I love the software, but I hope the new interface becomes easier to use! Also, while GetResponse is great for marketing most products, but it's not yet equipped for heavy e-commerce. Overall: I use GetResponse for my business site. It's been a great experience so far and I'll continue using it for marketing. Pros: Here are the four things I like most about GetResponse: (1) They are cheaper than competitors with a similar feature set. (2) They have a nice interface for searching subscribers. (3) Their live chat operators respond usually within seconds, and live chat is available 24/7. (4) The stats throughout the application update in nearly real-time as people open and click emails. Cons: I have three main complaints about GetResponse: (1) Most tasks take too many screens and too many clicks to accomplish. The interface could definitely be simpler. (2) The form templates and email templates are cheesy. They are missing simple, well-designed templates. (3) The double opt-in "click to confirm" emails are too slow to arrive. This hurts list growth. Pros: GetResponse is an excellent web-based facility which we use to manage multiple emailing lists for various brands. We particularly like the ability to create saved searches, individual campaigns and an easy to manage database. The wysiwyg editor is very good and works very well with our HTML code. Cons: We have occasionally had the odd problem with emails corrupting post send which is not ideal but have found as long as we schedule for a few minutes ahead and then check the preview we can get round this issue. Overall: GetReponse makes it so easy to manage our database, we can integrate it with other facilities such as mail munch and customers can unsubscribe to their choosing without any effort on our part. GetResponse, emails at the right time. Comments: It has benefited me in such a way that I have been able to establish a better correspondence in each email sent, this way I have been attending each client better and sending the necessary information, in the correct time. Pros: The great thing about GetResponse is the fast reception of Emails to all the subscribers to whom each email is sent, the truth is that the reception is processed in a matter of seconds each client has the email in his Email, the truth is that I am very proud of So good features that I've been getting from GetResponse. Cons: The problem of GetResponse is basically the support, I sent a couple of questions a while ago, about 3 months, and the customer service is not so pleasant, because if you do not understand what they are trying to say, you They respond with rudeness and even treat you badly. GetResponse - One of the best tools for email marketing! Pros: First of all, GetResponse offers a free 30-day trial to test them out. Currently, we're using the Pro package and it allows us to manage a big list of emails. Email automation is one of their strengths, setting it up is easy. We can also create forms and landing pages that converts. Making a form or a landing page is a very smooth experience. They have plenty of professional templates to use. Additionally, their pricing is very competitive. Cons: I do not like their new interface, it is cluttered. I wish they could make it simpler. Overall: Great for email marketing! Comments: GetResponse has helped me a lot in my company, because I have been able to create quite simple campaigns in a matter of minutes, send information about registrations, purchases of my company's products and much more, just by providing an Email. Pros: GetResponse is a quite reliable platform, what I like most about this platform is the ease with which you can create an advertising campaign, just with a few simple steps of adding a design and adding the desired text, you will have the campaign ready , the rest does GetResponse automatically! Cons: I do not like GetResponse for Anroi, I think it's a version too outdated and lacks a lot of renewal and more current versions of the web, I would like the creators of GetResponse to dedicate themselves more to improving the App for a better stay. Nice speed in campaigns and very easy create GetResponse. Comments: GetResponse has been a program of very good advances, and has brought excellent benefits to my company, since each client interested in our services, receives an Email instantly when they enter my campaign. Pros: What I like most about GetResponse is the speed with which this software is handled, when carrying out a campaign, it can be done in a matter of minutes, and send immediate answers to each person who registers with his mail in the campaign, the reception of the sent mail is almost immediate. Comments: Of all the email marketing tools we've used, and there have been several as many of our clients come on board with their own email marketing accounts already set up, or top choice is GetResponse. We appreciate that it has a lot of features we don't need yet but are looking forward to using as our marketing strategies grow. Pros: It has all the bells and whistles of the large name CRM programs but at a fraction of the price. We can import lists, set up automated email campaigns, create landing pages, and segment and filter the lists. For WordPress users, they just added a landing page plugin that makes it easy to customize the page on your own website. They make it easy to set up newsletters with the drag and drop tool but advanced users can still create custom letters with HTML. They recently updated the dashboard and I think it a lot more intuitive to find things. We always appreciate free trials and GetResponse gives you a free 30-day trial with up to 1000 contacts on your list. Cons: I don't really see any cons with GetResponse at this time. It really is my favorite email marketing program. A must have tool for small business owners and internet marketer. Pros: - The one thing that I liked most about Getresponse is its ease of use, I've been using other email marketing tool but getresponse is the best one at a decent price point. - They have excellent customer service, I needed help in my integration with email autoresponder and helped me, really fast. 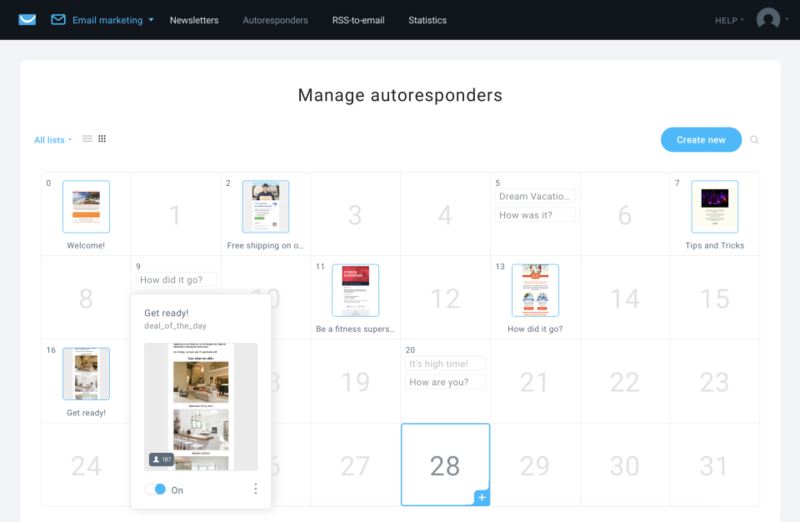 - Autoresponder feature is great with high deliverity, the one thing I liked most about gestreponse is the UI in Autoresponder , you can easily create a flow for sending email sequence. Cons: There is nothing that I can say I didn't like about it. Overall: One should give it a try, as compared to other email marketing tool at this price, one should definitely check getresponse. They even have a 30 day trial . Comments: GetResponse is a program that with the exact instructions, you can achieve job stability in the area of Email Marketing. However, I do not recommend using it without studying its functions. Currently it benefits my company, offering the way to supervise the campaigns carried out at all times. Pros: The special thing that GetResponse has, are the constant updates it makes on the platform with the sole purpose of pleasing the customer. Recently added functions such as: monitor campaigns from the mobile device, something that is very important in any company. Cons: The weak point that GetResponse has is customer support, although constant updates are made, the support takes more than 3 days to answer a question, something that is very annoying at all times. Pros: Good value for money. Good ideas from management (I suppose), good choice of features. - VERY BAD when it comes to RESPONSIVE emails. - HORRIBLE customer service: they're all NON-Native English Speakers and don't understand what you tell them - unless it's a SUPER BEGINNER question. They just don't get it. They assume every customer they have is a newbie or a grandma who has never sent any newsletter. It's very frustrating. - And... unclear fees when it comes to upgrading/downgrading your account. It's a game of chess to understand WHY you're getting charged some amount to upgrade. Overall: They were a great company and a great service. They still are somehow. I believe the vision of this company is still great. But the execution is poor, to be honest. The reason I talk about them as a company is that your email marketing provider is SO CLOSE AND PERSONAL with your business, once you know how to use it and make it your primary way of generating sales. It's becomes crucial to be able to rely on them. I hope they get better. 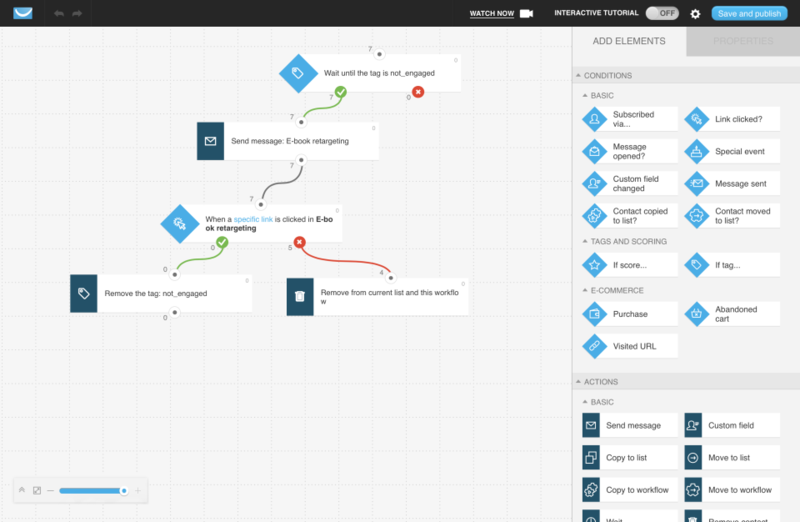 A quality email automation tool! Pros: GegtResponse is a great email marketing tool. Setting up a campaign is easy and they offer a tutorial on how to make one. The dashboard is simple and the icons are big enough. I like the feature of their landing pages. I can create a great landing page within a few minutes and it has a responsive design. Also, there are tons of templates to choose from. I can also create beautiful forms that I can place on our website. It provides a lot of advanced features as well and this tool is also affordable! Cons: I have some issues with their drag and drop interface. It is a little bit complicated. Overall: One of the best email marketing tool today! 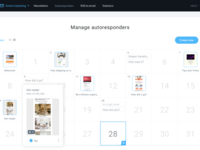 Overall I'm happy with this autoresponder platform for my mail outs. 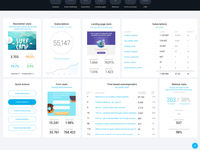 Pros: The dashboard is easy to read and has stats at a glance. I use it for my newsletters and find the layout with drag and drop features straight forward. Support is fast and tickets are answered promptly. Added bonus of live chat! I changed from a well known autoresponder which I found cumbersome, so Get Response is definitely an improvement in layout and ease. Cons: There is no easy way to edit templates - one has to do a completely new "newsletter" then save as a template. This is something I'm hoping they will fix. Sometimes the editor part of an area over rides what is being typed which can be frustrating not being able to "see". An adjustment of the block of writing does fix this. Overall: It is nice to be able to write then schedule my newsletters and in a format that is visually exciting for the reader. Having buttons to direct reader to links is also easy for the reader. Cons: When using these types of software at a more professional level, I believe it is essential to have detailed analyzes possibly on a single page of a contact's activity. Instead on this software, many data must be recovered from different points and in some cases are completely missing. Basically we send emails to customers and what we want to know for each customer is what and when we sent an email, such as (newsletter, autoresponder ...) of these were opened and linked. Everything should be available in the contact panel. At the moment instead I find only the emails that have been opened and for I am forced to go to find the other data "around" for the software. Also, some features are not as intuitive. Why can not I select contacts from a list and bring them all on the same day as the autoresponder with a simple click? To do this I have to select the contacts move them to the same starting list (??) and assign them one day to the autoresponder. Cases like these there are many. Statistical issue. When I want to see who has opened or who has not opened a specific mail from the statistics I have very few possibilities to use these two lists directly from the statistics section. Excellent way to cover Email Marketing. Comments: I benefited GetResponse because unlike other platforms, this has given me a better comfort to have Email Marketing within my company, the stay within this platform is a more advanced stay. Pros: I like that GetResponse is a software that has nothing complex, that all its functions, absolutely all, are easy to use and have no risk of something going wrong in the configuration of Email Marketing. Cons: It is not good that GetResponse has such bad customer service, this affects recurrently in the use that is given, since it would not be comfortable to be configuring the platform, and that has a poor support to address the customer's doubts. I like the results that are currently giving me. Comments: I have benefited from the use of GetResponse because I have managed to stabilize very well the Emails that I send constantly, in this way, I have been able to immediately contact each client. Pros: I am pleased that GetResponse is a software with a quite innovative design, with colors that really please and give life to the platform, make it much more reliable and secure with respect to the stored data. Cons: I do not like that GetResponse has such high prices, however, I consider that it does not have other errors, it is a very automated software and the only negative detail that I see is that of the high prices it has. Automation is very expensive at GetResponse and I would like it to be more accessible. Comments: The use of GetResponse has benefited me greatly in my company, since I have managed to send sales letters, inform about our products, deliver free manuals, send newsletters or newscasts, welcome new subscribers. Pros: What I like most about GetResponse is that it allows you to create mailing lists of visitors to your blog, website or business, helping you to develop solid relationships with them through email. Cons: The problem with GetResponse, is the price, in this way, having an automation of GetResponse, it turns out to be something very expensive, and I would like it to be something cheaper and accessible for most people. Excellent achievements with accessibility from various devices. Comments: I have benefited a lot from the use of GetResponse, since before I had many problems sending consecutive emails and in an instant way. In my company it has been very necessary to send emails quickly, and with GetResponse I have achieved it. Pros: What I like most about GetResponse is the excellent way in which you can work from any device and carry out a campaign using a simple mobile phone, it is very practical software. Cons: I do not like that GetResponse has such high prices, obviously its functions make it quite expensive software, but I would like some prices to go down some plans for better accessibility when buying plans. The automation and good ease of GetResponse. Comments: I have benefited from the use that I am giving to GetResponse because I have had more automation in my company, I have achieved that the workers in the Marketing area work less for the automation of GetResponse. Pros: I like GetResponse because it is a platform where you do not need to read instructions, it is one of the few marketing platforms that are easy to use, because here you can adapt services too quickly. Cons: I have not had complaints about the services offered by GetResponse, and I hope it continues like this for a long time as I see that it is a stable platform capable of completely satisfying the client. I use Get Response to handle my customer lists and to help me in emailing newsletter updates. Pros: It is easy to set up. It takes a little getting used to how it operates. But once you are familiar with the system, it is very easy to use. They are continually updating new features for you to use. I especially like the ability to custom make our landing pages and our automated email system. Cons: Trying to configure the coordination between your website, the landing page, the free download and then enter the client into an automated sequence - it can be challenging to learn. If you do not use it on a regular basis, it is like starting all over again. Once set up, it will operate indefinitely. But if my needs change, and I must go back in to change something - it is almost like I have to start all over again. This can be very frustrating. Automated mail is the most beneficial factor of GetResponse. Comments: I have benefited from the use of GetResponse because I have managed to have a good connection with the subscribers of my emails, and thus send them much more followed and automated emails in my company. Pros: What I like most about GetResponse is the design it has, I really feel very comfortable using GetResponse in my company because it gives me the best quality and comfort possible. Cons: I do not like that GetResponse has such high prices, but on the other hand, I do not have any other complaints about this platform, since at a certain point, it has fulfilled most expectations. Pros: I loved the fact that I was able to get up and running so quickly. You can easily integrate it with other software. Literally with a few clicks of a button. Cons: When I first signed up I had to contact support because it wouldn't load up. This was because my cache needed cleared. Support were very quick to rectify the problem and very helpful. Pros: Getresponse is priced adequately for someone starting a business or someone that is going into internet marketing or affiliate marketing. Cons: Not as advanced as some of the ninja tools out there but in most cases you will find that it is more than sufficient for what you are trying to do. They have a free trial so use that. The templates could be improved and added to. Pros: We moved away from GetResponse for a short while due to a lack of Magento 2 integration, CRM and Automation features. We have now returned as they've corrected their integration and now have some fantastic marketing automation facilities. Cost is excellent compared to other platforms. Cons: Customer support knowledge could do with improving. Excellent automation, almost everything GetResponse does. Comments: I have benefited from the use of GetResponse in my company, since we have many people who have subscribed to our emails, and we do it automatically and instantaneously, the sending. Pros: I really like the design that GetResponse has, this has totally increased my interest in making an advertising campaign, since it makes it more fun and more comfortable. Cons: I do not like that GetResponse emails take so long to arrive, as many customers have told me, they do not immediately receive the information I send by this means. 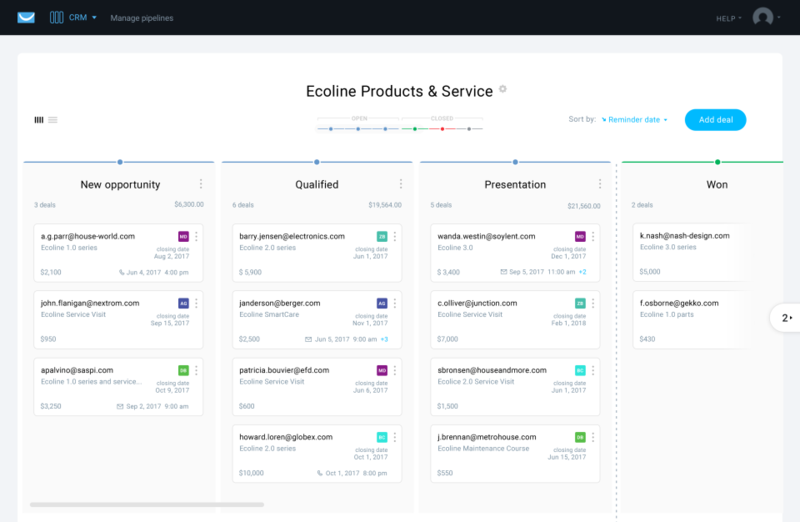 Pros: I love the features of GetResponse, including webinars, email automation, smart lists and even landing pages. It is a real step up from Mailchimp and I am getting great value out of it in my inbound marketing. The price is also fantastic. Cons: I would say the only con is that you would want to have all of the features, which obviously aren't included in the cheaper plans. You will need to budget (depending on your list size) to get the best value. I use GetResponse to manage email groups and send emails to different target audiences. Pros: I like that it will manage the "unsubscribe" feature for me so I don't have to manually unsubscribe the people that wish that. I like that it has an option to chat with support and the chat option is obvious so I don't have to go hunt it down when I am having an issue. Cons: I made a mistake and sent an email to an unintended campaign, leading to a mass unsubscribe. I was then, not able to send another email to those people apologising for the mistake and it took customer service over a week to get it figured out with me while in the meantime my whole account was on "lockdown" - it was also very difficult for me to convince them it was an honest mistake. Overall: I am able to maintain many different email lists and customise newsletters to each. Outstanding Application and Great Value. Pros: I was just about to spend $97.00 per month for a way to create affiliate funnels when I tried GetResponse. This application gives you so much for your money I was surprised. I am able to do so much for so little per month. GetResponse support is also very good. They have some really nice support people who are experts and help me out all the time. Great program!! Cons: Nothing really wrong or bad about GetResponse. Very user friendly. Overall: I have used GR as a funnel tool as well as a program to help me with my Shopify store. I can send emails to my customers that look great right out of the "box". Pros: - Very user friendly. - Loaded with awesome features that enables you creating everything you wish. - In addition I love their affiliate program where i'm actually participating in. - I do a lot of campaigns through GetRespons and all of them brings me unbelievable results. Overall: I have a lot to say but the main thing is that my business increased with 74% since I started to use GetResponse. One of the best email marketing and marketing automation platforms avaliable. Pros: Many features, including: autoresponders, landing pages, marketing automation, and webinars. Good value. Cons: Can get on the expensive side as your mailing lists grow, but still should easliy pay for itself if you are mailing regularly. The presentation of campaigns in GetResponse is much more varied. Comments: Its use has benefited me entrepreneurially, since I have managed to bring Email Marketing to another form of work, make it much safer and achieve campaigns with a better design and presentation. Pros: I like the GetResponse interface more than anything, since it organizes very well each of the functions it has, it is worth mentioning that it also has very innovative functions that complement an advertising campaign. Pros: Autoresponders, automation, easy use and intuitive interface; very good support - helping database, as well as live online support. Pros: I love that the software is really affordable. The company is always adding new things and improving which is great. It is a one solution for our email marketing. Custom templates are great! Cons: It`s a good way to start any Mail Marketing strategy, but no so much for those who need a big data control of their business. They have a daily limit of 50 emails, which works for us but we would rather send out the emails all at once instead of only that many a day. I don't think the tutorials are the best either. Pros: GetResponse does help create emails and landing pages fast. By having the connection between having the email database, email creations, and landing pages it does make it easier to segment contacts and easily keep track of them. For the price, it does offer a basic and easy tool for beginners or those without much design experience to help more easily create. Cons: It can be frustrating using the drag and drop editor and in comparison to other drag and drop editors and it can feel very limited. It gets frustrating when elements do not move as they should and designs do not come out as imagined. It takes some playing around and getting used to in order to use efficiently. 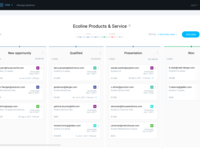 Overall: GetResponse helps segment and target customers more efficiently. By keeping landing pages for products and courses connected to email contact database it is quick and easy to create emails for targets groups. Pros: It has most features you need to set up a list and emails them via autoresponder or newsletter. Cons: Editor does not spell check. The reporting tool is a bit complicated to use. The editor does not automatically create the plain text version. You cannot easily cloan a letter series over to another campaign. Overall: Overall good. But considering lower cost options. Get Response is efficient without some of the bells and whistles. Pros: One of the things that pushed Get Response to the top when making our decision was pricing. The generous discount they offer to non-profits was hard to turn down. It does everything we need it to do and it does it well. Especially the automation flows. Cons: Some of the templates are a bit antiquated. This is something that could easily be rectified with updates of the current, and additions. The other area that has some room for improvement is the drag and drop. Not a seamless process, but could easily be updated to make it more user friendly. Overall: The benefits are many. We can schedule our weekly eblasts, feeling confident that they will be sent, properly formatted and on time. We can stagger which has proven to be a benefit. Excellent email platform that is easy to use! Pros: The navigation of the platform is clean and simple, intuitive so that any novice and jump right in and start sending beautiful emails. Cons: The deliverability is not always up to the standard of other email service providers, but they make up for it in ease of use and functionality. Overall: Automated workflows are a personal favorite so I can set it and forget it! Pros: All email marketing software have this existential crisis of what they should add to their features to make their product more powerful. Instead, most of them (including GetResponse) should focus on one specific target market and become the easiest to use for them. Over time GetResponse has added powerful features, and become complicated in the process. And it doesn't help that the who UX looks outdated. On the plus side their customer support. It's one of the best anywhere online. Cons: Outdated designs for templates and the UX. It makes you feel it is a 2.0 version of something that should be a 4.0. Overall: Greaty support, great features, great price but a bit too complicated and outdated designs. Pros: They are fair and wont randomly stop you sending emails unlike mailchimp. Its very easy to send well designed emails. Cons: The webinar software isn't that great, it's a little bit pricey when you get into the thousands of subscribers. Comments: At first glance, it appears not immediately easy to use, but when comparing it to other autoresponders it is one of the most intuitive. It allows you to create endless lists and send Broadcast (Newsletter) and Follow Up. There are several ready-made templates, and you can import your own, then just insert the object and the text of the mail you want to send, choose whether to send it immediately or set a day and time in which we prefer to postpone the sending and it's done. It is also easy to create a sign-up form to include in your landing pages. Just choose from the various templates and customize it by changing the text. GetResponse will provide the HTML code to include in the website or page. This is the most important thing to consider when you choose an autoresponder. GetResponse from this point of view is second to none, the reliability is its strong point. It uses powerful latest-generation strategies to circumvent spam filters and to reach the email receiver. Pros: Getresponse sure gave me good value for my money. The ability to create landing pages and setup autoresponders seamlessly is awesome. when i started to use getResponse for my blog, i could say that my list started to see positive increase. Less of my emails, went into spam and deliverability issues were reduced. In my view, the only area they need improvement is in their integrations. Overall: It's been great generally, the free trial was something that attracted me to start using GetResponse in the first place and i really haven't regretted using them for once. I feel mixed about the software. Pros: I like that the templates, overall, are easier to use than Constant Contact. I also like that they check the spam score on your emails before you send them out. Cons: The SalesForce integration is absolutely terrible. It does not work AT ALL. Also, the customer support for it is also absolutely terrible. Overall: Ease of use in regards to the templates, getting to see what kind of likelihood of the email being rejected could be. Pros: The messages send without issue, and the lists are up to date and accurate every time. Cons: We had a problem with MailChimp not keeping an up-to-date list of our contacts, requiring us to call numerous times to have the list "refreshed", and because of that, switched to GetResponse.The lists on GetResponse can be a bit "clunky" to get used to, with search options specifically. Once mastered, however, it's not bad. Pros: As a solopreneur, GetResponse delivers what I need at an acceptable price point, and provides responsive service. The HTML email builder is easy to use, drag-and-drop, and comes with many usable designs. Cons: I'm not in love with the basic interface, which is OK, but clunky. While the API is available, few other providers seem to integrate with the system - unlike Mailchimp or Aweber, which seem to integrate with everybody. Recommendations to other buyers: In its current iteration, GetResponse is very competitive product for what it provides. I understand that they are about to launch an upgrade to their service which would compete with ActiveCampaign. This could be a very welcome evolution. Overall, it does everything that an email marketing service should do without causing too many headaches. If you want to know more, I wrote a more in-depth review here (https://www.ventureharbour.com/getresponse-review/). The user interface could do with a lick of paint and a rethink from a talented user experience expert. I find the labelling of navigation and my ability to find what I'm looking for quite unintuitive. I'd also love to see their automation service developed a bit more. As it stands it's okay but quite limited in terms of what you can automate. Cons: - Have seen landing page platforms I think have better looking pages, but for the price GetResponse is a good option and if you use their email integration I'm sure they tie everything together nicely.